The JumpKing Mini Oval 38" X 66" with Green Pad is the perfect way for youngsters to burn off energy. The trampoline features the following: 3.5" galvanized springs (36); An easy to assemble top rail system with 8 top rails; A rust resistant galvanized steel frame; A large jumping surface in unique oval shape; 2 handle bars for stability with height of 24" each. Trampoline height is 16". Total height is 40". 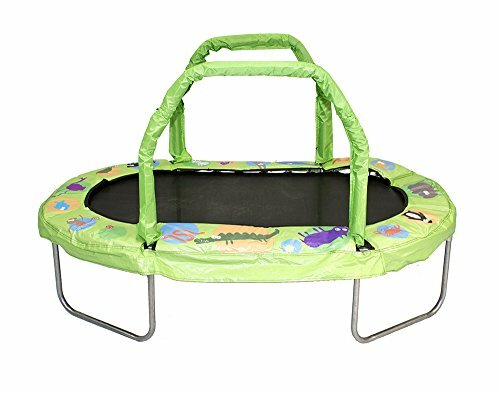 Trampoline includes a colorful green animal printed safety pad with mounting straps to secure pad. It also has coordinating green foam sleeve covers to match safety pad. Trampoline can be used indoors or outdoors. Maximum weight capacity is 110 lbs. If you have any questions about this product by JumpKing, contact us by completing and submitting the form below. If you are looking for a specif part number, please include it with your message.